1. 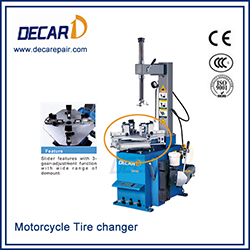 Special tool head designed specifically for the motorcycle tire, which can meet the motorcycle tire from 6' to 24' , it is unnecessary to equip other tool head as option. 2. Specially designed the structure of the bead breaker blade, easy to operate, thicken the bead breaker rubber pad to assure demounting the motorcycle tire with break disk. 3. Slider features with 3- gear- adjustment function with wide range of demount. 4. Swing arm demounting and mounting structure is economy and practical. 5. Features with the auto self- centering function, safety and reliable.